The Delete Bin has a roving reporter in writer, cultural critic, and world-traveler Geoff Moore. More to the point, he’s conducted a musical pilgrimage in visiting one of the Holy Places of Rock ‘n’ Roll: the City of Liverpool, birthplace of Echo & the Bunnymen, Frankie Goes to Hollywood, Shack, The Pale Fountains, The Lightning Seeds, The Zutons, Gerry & the Pacemakers, The Searchers, the LA’s, and most importantly a little band called the Beatles, who put the city on the musical map. And what did Geoff find there? A whole industry, and we’re not talking about the Albert Docks; at least not primarily. There’s been a lot of water through the Mersey Estuary since Liverpool’s founding in 1207 and its very recent co-starring turn as a European Capital of Culture (2008). From the water, aboard a ferry, the old port’s skyline is a genuinely inspiring sight sweeping left to right from the Three Graces* at the Pier Head, past the beautifully refurbished red brick Albert Dock to the utterly massive Gothic fortress that is the Anglican Cathedral. There are another 2,500 listed, or protected, buildings in and around this city of almost half a million northern souls. Despite eight centuries of recorded history, we will concern ourselves with the magical years 1961-63 and 2010, yesterday and today, because ‘Ich bin ein Delete Binners.’ Liverpool’s importance as a seaport has been negligible since the Beatles broke up. The Victorian facilities are obsolete and, anyway, it’s a mighty long way to China when all of your antiquated quays face North America. The most visible industry in the city, the Jaguar plant aside, is Beatles tourism. While some visitors may have more than a passing interest in Billy Fury, Merseybeat, Gerry Marsden, Echo & the Bunnymen and perhaps even Atomic Kitten, the Beatles remain, as John might have put it, ‘toppermost of the poppermost.’ They are now so synonymous with their hometown that you could easily embrace the wrong-headed notion that nothing else of any consequence happened in Liverpool. Ever. Downtown Liverpool is easily traversed if you’re wearing a decent pair of shoes; there is a welcome human scale to the city. Mathew Street, the focus of an area rather optimistically dubbed the Cavern Quarter on way-finding signage, is little more than a crooked backstreet. Thank God it’s closed to traffic. The milling tourist carnage would be genocidal. The original Cavern Club, host venue to the Quarrymen, the Beatles, the Stones, the Who, the Kinks (you get the idea), is long gone. What exists about three doors down and deep underground at 10 Mathew Street is a painstakingly rendered replica of the Cavern Club, a job well done. 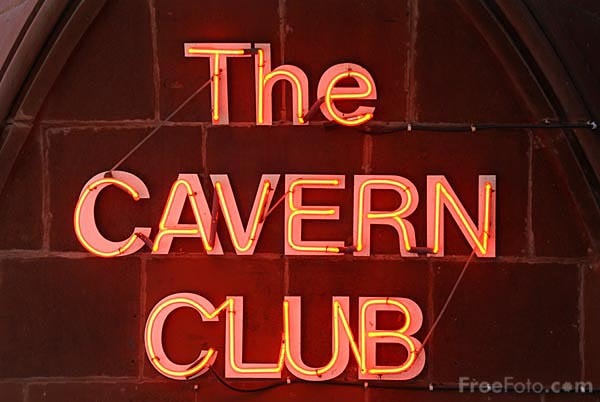 Most of the Cavern Club’s memorabilia collection, including signed Beatles instruments, is housed on the other side of Mathew Street in the companion Cavern Pub. The bricks used to recreate the iconic pillars and the low, vaulted ceiling were salvaged from the original site and reused. The new club also occupies a significant portion of the old one’s actual floor space. Another visitor said, ‘You can almost smell the sweat from all those years ago.’ Well, you can’t; the past exists in an alternate form and the demarcation between historic site and world-famous tourist trap is a puddle of unfiltered, muddy water. This being 2010, there is a display cabinet of Cavern souvenir merchandise facing the bar: t-shirts, hoodies, coffee mugs, lighters, key chains, CDs, books and postcards. If only the bar was as well stocked. The selection of draught is disappointingly generic, there’s no ‘Highly Estimable’ Cains bitter to be had, no ‘Liverpool in a Pint.’ Fortunately, there are a few other pubs in the vicinity. Ones with as much, maybe more, Beatles cachet than the revived Cavern Club. Across the cobblestones from a fully scaled photographic mural depicting the door of the original Cavern Club is Grapes , a public house at 25 Mathew Street. In the back there is an enlarged photograph of John, Paul, George and drummer Pete Best drinking and smoking at the table it hangs beside. In case you can’t put two and two together, there is a cheat-sheet brass plaque beneath the shot which reads: THIS PHOTOGRAPH WAS TAKEN HERE (helpful directional arrow). The band also killed time between Cavern sets around the corner in Rainford Gardens at the White Star. A brass plaque at the entry insists this fact is DOCUMENTED. The pub’s decor is maritime, lithographs of White Star ocean liners; if you make your way into the back room there’s a Beatles shrine wall over an upholstered bench and, unsurprisingly, four more brass plaques: JOHN, PAUL, GEORGE and RINGO. Easily walkable but a bit too far to stagger from the Cavern Quarter is Ye Cracke on Rice Street. There is a plaque inside, blue this time, commemorating the ale swilling habits of the Dissenters, a short-lived group of art school students whose goal was to make Liverpool famous through their painting, writing and music. Membership included John and his friend Stuart Sutcliffe, the Beatles’ first bass player. And, as one drinker put it, ‘John used to meet Cynthia here’. Or met her here. Or something.’ Not a hot topic for the blasé locals who were still abuzz over Everton defeating Liverpool F.C. in the Sunday derby match, proof that there is life after the Beatles. Liverpool’s historic docklands has been cleaned up. There are new hotels and residences, charming pedestrian paths along the water, an arena and convention centre complex with a nearby Ferris wheel; a Merseyside museum is slated to open in 2011. The gem is the Albert Dock, home to, among other attractions, The Beatles Story . This exhibit is a pleasant stroll through the Beatles’ legend. Each room or gallery is devoted to a specific phase in the band’s career. Content is a mix of artifacts, looped audio/visual snippets, large format graphics and props, a combination compelling enough to engage most curious fans. For example, the gallery dealing with their days in Hamburg is done up as an alley in the seedy St. Pauli district, complete with neon signs and a rather fetching streetwalker mannequin in a black raincoat. Here is where a visitor is introduced to the characters of photographer Astrid Kirchherr and future Plastic Ono Band bassist Klaus Voorman, and learns of Stu’s death. The most surreal moment in The Beatles Story experience is not the psychedelic Sgt. Pepper/Yellow Submarine flashback, but stepping onto a movie set Mathew Street, seeing the silhouettes of the punters in the window of the Grapes and then entering yet another Cavern Club all the while knowing the actual locales are just across the Strand and up the hill. Perhaps it’s nothing to get hung about? After all, realizing that the Beatles, and by extension rock ‘n’ roll itself, and therefore a part of you, have all been consigned to a museum is enough cognitive dissonance for one day in a life. Stay tuned for part 2 of Geoff’s pilgrimage to the ‘pool of life’ in Britain’s northwest due to appear here on the ‘Bin on December 8th!